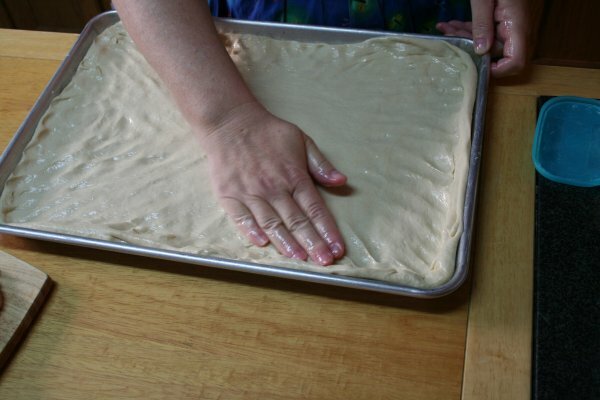 German Cooking Week - How to Make Zwiebelkuchen - Super Mom - No Cape! Our German landlady would often leave baked treats in front of our door. Dave has always been slim and I sometimes suspected that she feared that I wasn’t feeding him enough. Or perhaps it was simply her way of trying to make us feel welcome. 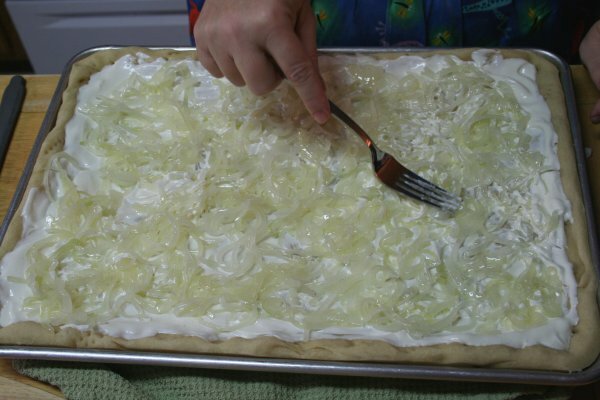 In any case, we were in for a special treat as the onion “pizza” was actually Zwiebelkuchen and is a traditional early fall dish in Southern Germany. The next day, I went down and with the little bit of German I’d acquired and the help of her daughter to translate, I begged our landlady to teach me how to make it. 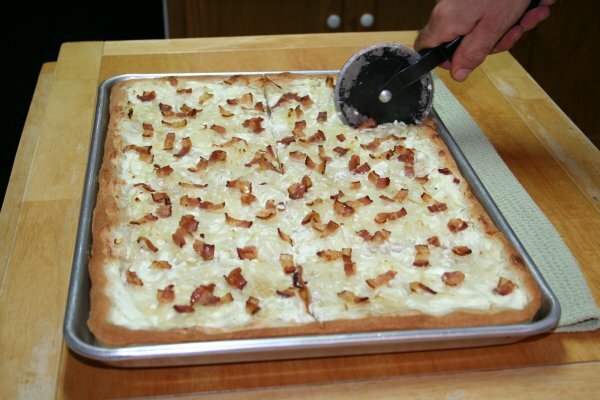 You’ll find fancier recipes for zwiebelkuchen in German cookbooks or on Gasthaus’ menus. 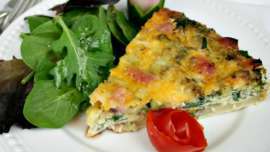 Many of those recipes call for the addition of eggs and caraway seed. 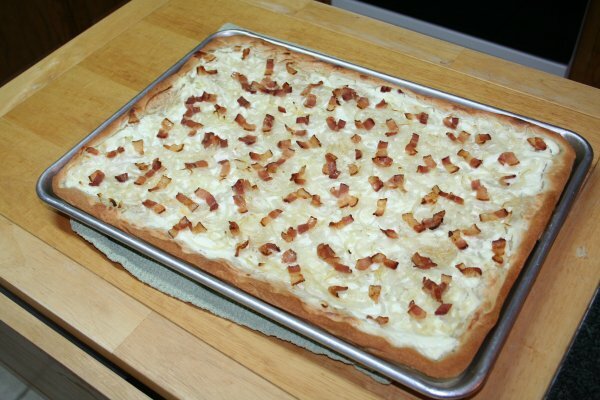 Zwiebelkuchen is one of those peasant type dishes that the march of time and modern day has “gourmetted” up. The hausfrau of old would have likely used whatever she had on hand the day she was making it. 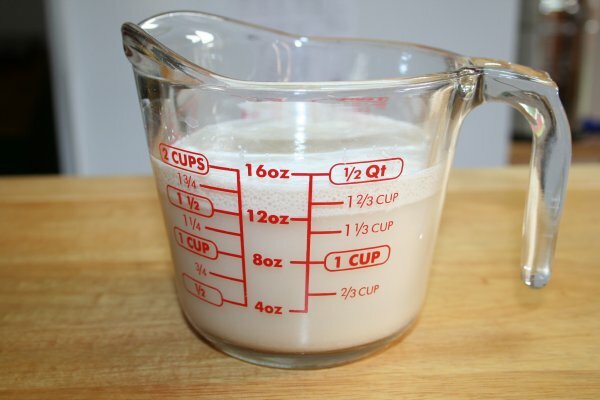 This may not be the zwiebelkuchen you are familiar with but it is the recipe that our German landlady taught to me, adapted for North American ingredients. 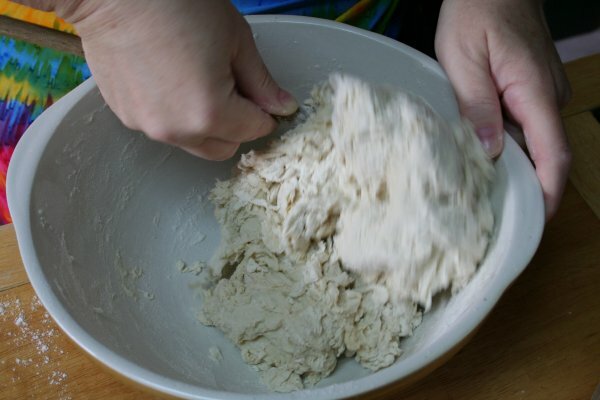 Combine flour, salt, oil and yeast mixture in a large bowl until it forms a shaggy mess. 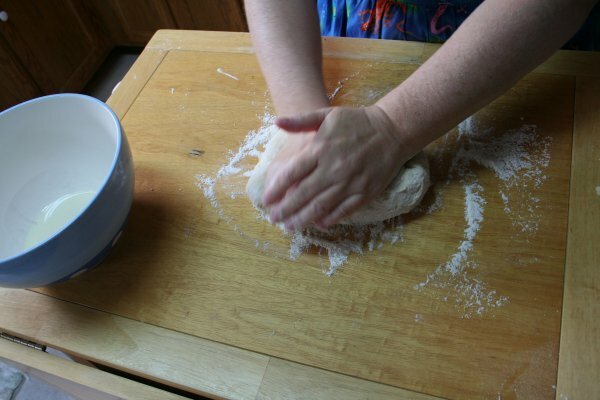 Scoop the dough out onto a floured surface and knead until the dough is soft and pliable. 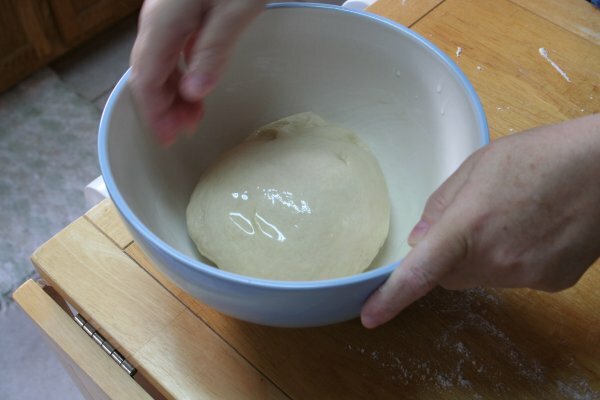 Place in a lightly oiled bowl; turning to coat all sides of the dough. 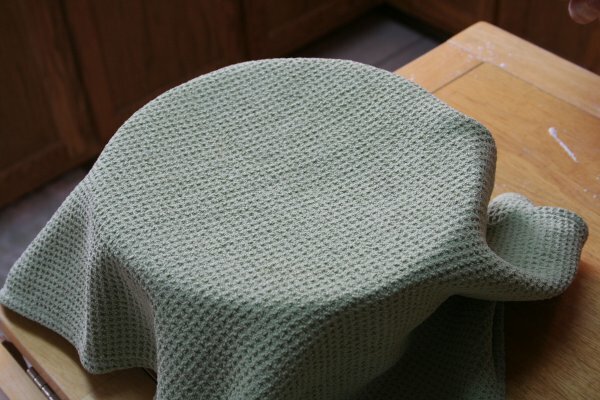 Cover with a towel and allow to rise for 30 minutes. 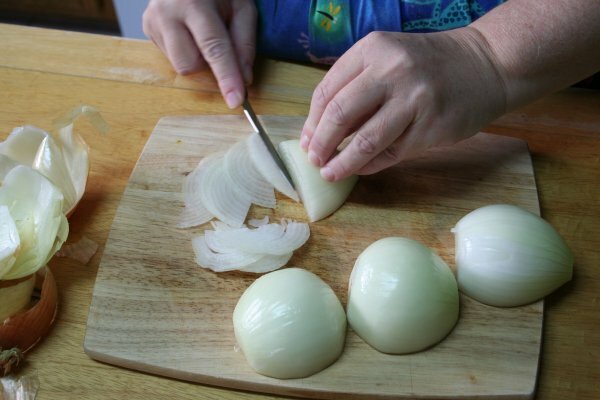 While the dough is rising, thinly slice 2 large onions that have been cut in half. 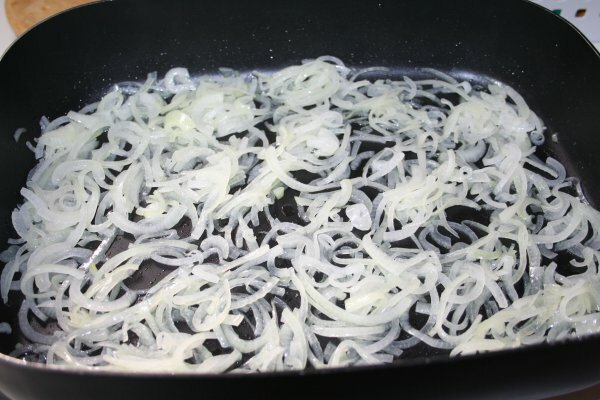 Saute the onions just until they are translucent. Do not let them brown. 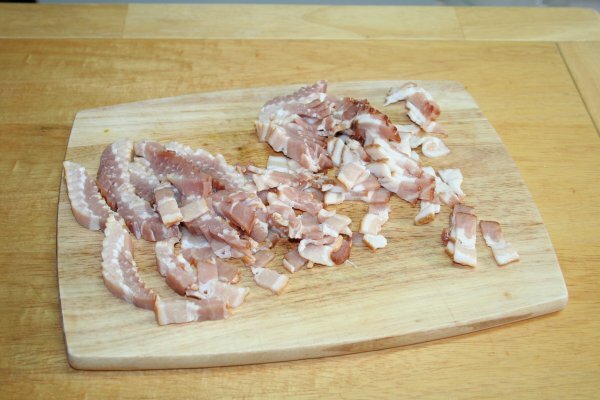 Chop ¼ lb of bacon. This is actually 1/2 lb of bacon chopped. I used the other 1/4 lb for something else. 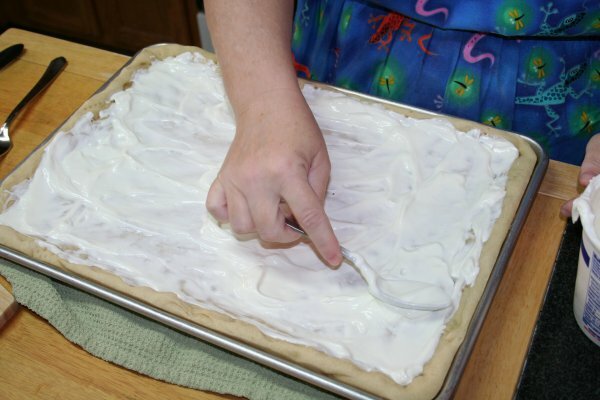 Spread the dough over the entire bottom and up the sides of the baking sheet. 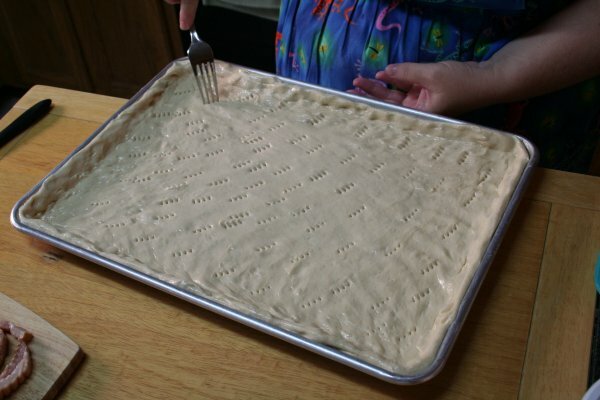 Dock the dough with a fork. 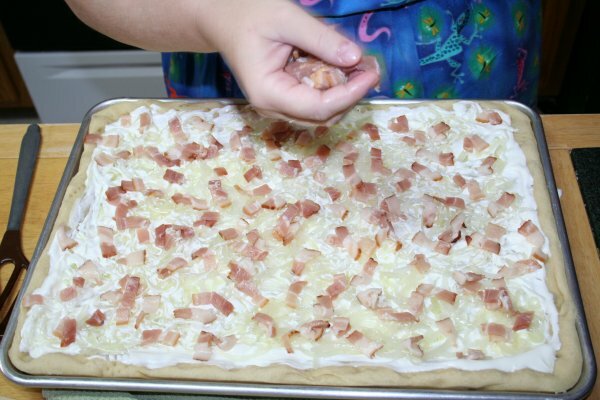 Remove the crust from the oven and spread with sour cream. Next layer on the sautéed onions. 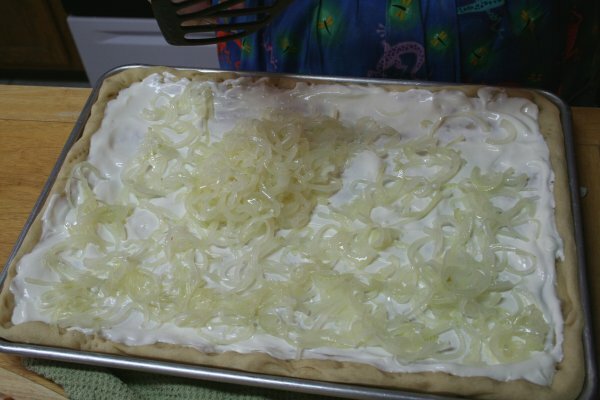 Make sure to spread the onions evenly over the sour cream. Return to the oven for an addition 20 to 25 minutes. After 20 minutes, check to see if the bottom of the crust is a light golden brown. If not, put it back in the oven for 5 to 10 more minutes. Slice the zwiebelkuchen and serve hot. Enjoy any leftovers the next day. 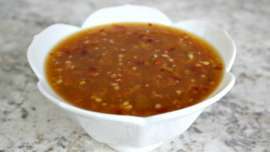 It can be eaten cold or reheated. Zwiebelkuchen freezes well and our kids often used to take the frozen slices to school. By lunchtime, the zwiebelkuchen was thawed and ready to eat. This looks so good! I am waiting on dough to rise to make a foccacia with left over tomato salad. 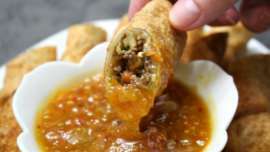 I want to try this soon. I love the pictures of your spaetzel! I need to try that also! YUMMY!!!! Oh, this sounds delicious. Rich and oh, so good. YUM! I really like German food.